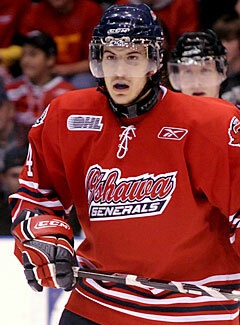 Oshawa Generals defenseman Michael Del Zotto, the No. 15-ranked North American skater, has tried to emulate aspects of his game after Bobby Orr. Watch Del Zotto's scouting video! Most of the top prospects for the 2008 Entry Draft cite today’s stars among their favorite players -- Sidney Crosby, Alex Ovechkin, and Nicklas Lidstrom. Oshawa Generals defenseman Michael Del Zotto, though, looks to a past star Oshawa defenseman who proceeded to be arguably the best player in hockey history with the Boston Bruins. The Orr influence came from Del Zotto’s father, a former Junior A player in North York, Ontario, where Del Zotto was born. Del Zotto may not have Orr’s transcendent style of play, but he’s an offensive-minded defenseman who could be a long-time quarterback for an NHL power play. His 63 points (16 goals, 47 assists) were third among Ontario Hockey League defensemen, and his eight power-play goals were tops among Generals defensemen. He had another eight points in 15 playoff games. All that success earned him the No. 15 ranking among North American skaters by NHL Central Scouting. Del Zotto, who won’t turn 18 until June 24, does have room for improvement. Like most teenage offensive-minded defenseman, coverage in his own zone is an issue. At 6-feet tall and 196 pounds, he is big, but he can be more physical and apply his size in the right way. That was Del Zotto’s plan coming into the season. He went from a minus-1 in 2006-07 to a plus-7 this past season while playing the same number of games, 64. In the playoffs, he improved from a minus-5 in nine games in 2007 to a plus-1 in 15 games in 2008.